"Receiving in a personal manner the artistic message from the visual universe. Competence: Highlight the plastic language elements and their inter-connections, with the purpose of interpreting bi- and tri-dimensional artistic images – drawings, paintings, photographs, sculptures and architecture. Contents: morphology and syntax of the bi- and tri-dimensional image; specific means: drawing; value harmony and contrast; colour harmony and contrast; suggestions for material choice. These are the official indications about how to explain to 15 and 16-year-olds what art is and what its roles are, the law explaining to the teachers how to provide their pupils with "the universal key for decoding any image" . Once one knows the formal laws of producing artwork, if one knows how to recognize a contrast or how to discern between closed and open compositions, one automatically understands the message as well. A phtotgraph of Joseph Kosuth's "One and Three Chairs" is printed in the ambient design chapter in one of the 10PthP grade schoolbooks. High-school pupils are taught, generation after generation, that art is mainly a matter of technique, a domain in which, if one studies with reverence and attention the great masterpieces, one acquires knowledge about "accepting values form the universal heritage of plastic arts" and develops "a taste for the beautiful". This vision, presenting art as a combination of traditional techniques and abstract symbols, undermines its place in society, causes it to be perceived, and therefore to become, a useless thing, pure decoration that does nothing to change our lives. Young people continue to be educated in the spirit of the old totalitarian methods, which tried to separate art and culture from real life, so that they would lose their essential justification, lose the real reason for their necessity: their status as a realm of freedom, where reality is analysed critically, their status as an instrument that helps us be equal and able to listen to each other. After graduation from the faculty of arts, one wonders what to do next, in a confusing context where the artist's status is, for various reasons, an awkward one. Whatever one says is not taken seriously, because artists are "dreamers", living in their own world; on the other hand, if what one says is too serious, it is no longer art, because art should always talk about "beautiful" things. This being the situation, we ask ourselves what could break this logical chain. Maybe proposing a different point of view would change something, however little. As a contribution to Periferic biennial, section Social Processes, curated by Marius Babias and Angelika Nollert, we have written an art schoolbook as we would like it to exist. A schoolbook that wouldn’t just teach its readers more things about art, but which would make them wishing to be better persons, more tolerant and open minded, wishing to live in a better society. To each of these purposes we related a certain topic: everyday life, collaborative projects, institutional critique, feminism, multiculturalism, political art, art for social change. 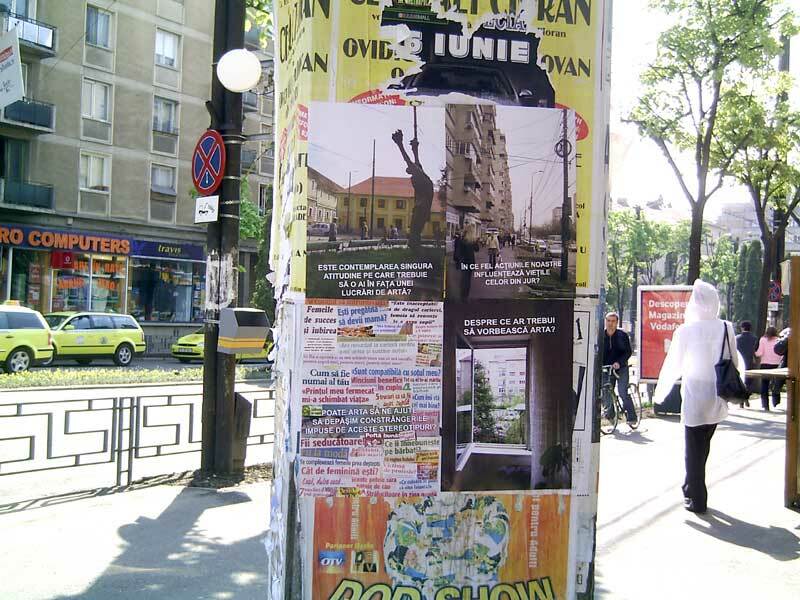 For each of the chapters we have made a different poster using one question related to topics discussed in the text and an image from the Romanian context.